Halifax will kick off their 2018 Championship season with another showdown against part time rivals Featherstone Rovers at Post Office Road. Currently, until Fax confirm any more pre-season games, the possibility remains they will line up against John Duffy’s side on February 4 for a third game in succession; the two teams met at the Shay on the final day of last season and play a warm up fixture at Featherstone on January 14. 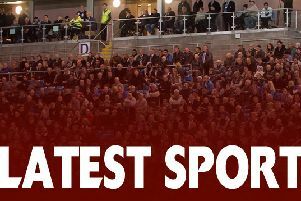 The Championship fixtures were released on Wednesday, with other highlights including a round three clash with promotion hunting outpost club Toronto at the Shay on February 18. The return game in Canada is scheduled for the end of April, while Fax’s other long haul trip, to Toulouse, is on March 24. For the first time in recent years, the club’s fixture list is without a six week string of away games in midsummer to allow work on the Shay’s playing surface; Richard Marshall’s team will now be away from home for a maximum of three games in succession. Fax have continued their re-signings of this year’s successful team, with young utility player Chester Butler the latest player to be confirmed for next season. Butler, the grandson of rugby league legend Colin Dixon, is currently on World Cup duty with Wales.